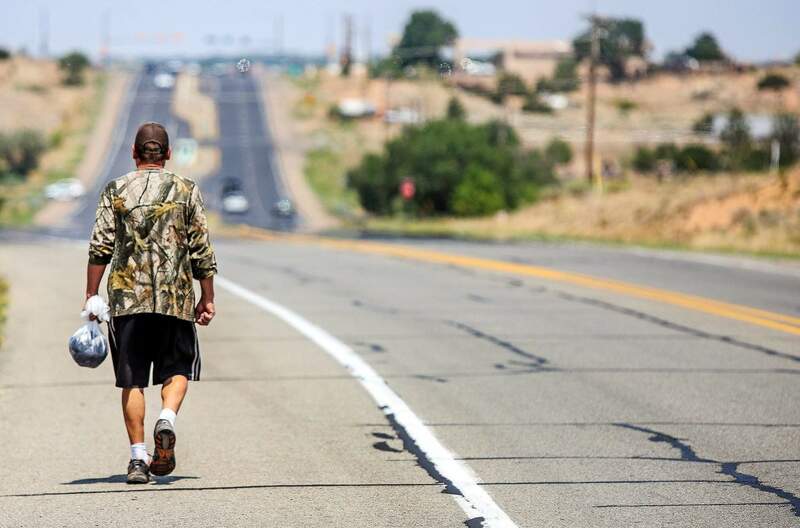 George Donald takes a break to smoke a cigarette before continuing his walk along Highway 14 after his release from Santa Fe County jail Aug. 2. 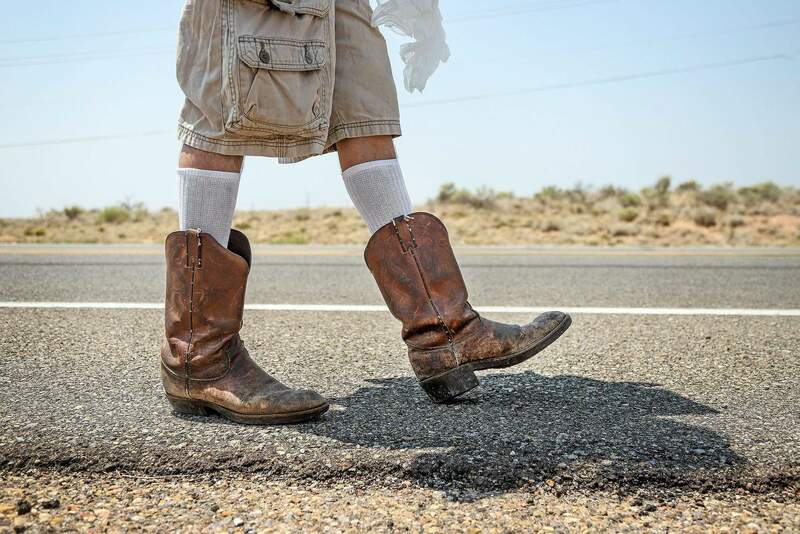 SANTA FE (AP) – Connie Krickhuhn isn’t sure why her younger brother tried to cross Interstate 25 near Cerrillos Road on a dark October night nearly three years ago. Alan Cruthirds, incarcerated for two days after being cited for drinking alcohol in public, a misdemeanor, had been released from the Santa Fe County jail just hours before he died. He was struck by multiple cars while crossing the highway at about 7 p.m.
Krickhuhn thinks her brother may have been making the long walk from the jail, south of Santa Fe off New Mexico 14, to the city’s homeless shelter on Cerrillos Road. It’s an 8.4-mile trip. When she heard about Cruthirds’ death, Krickhuhn said, she had all kinds of questions: Did he get fed in jail? What kind of services did he receive? Was he in a hurry to get across the highway because he was hungry? But one question stood out above the others: Why didn’t the jail give him a ride? No choice but to walkAlthough jail officials say they offer transportation to those who have been released, former inmates and advocates contend the options to return to Santa Fe are limited – if they know about them at all. 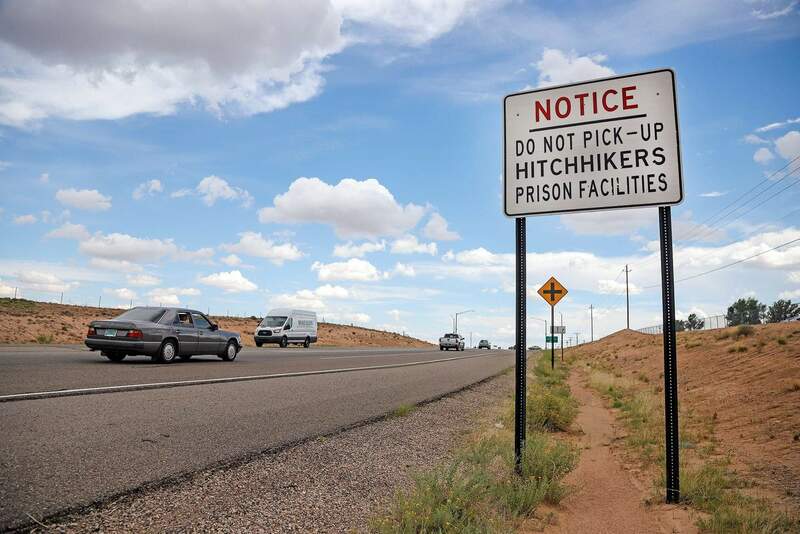 A notice advises motorists not to pick up hitchhikers near the Santa Fe County Jail and the Penitentiary of New Mexico along Highway 14. Released inmates say they sometimes have no other choice than to make the miles-long and dangerous walk back to the city, sometimes in the dark, with the potential for weather extremes. It’s a particularly harrowing trek for those who are homeless or don’t have family or friends who can take them to a safe place. The walks are no less concerning for at least one business on the route – the convenience store where employees say inmates who stop there create discomfort for customers – and advocates for the homeless, who worry the problem only exacerbates a chronic issue for that population. Joseph Jordan-Berenis, director of Interfaith Community Shelter in Santa Fe, has spoken with plenty of homeless guests who have made the walk, and he said the issue is a community problem. Robert Benavidez begins the walk up the hill to the Allsups on Highway 14 after his release from the Santa Fe County jail. For many inmates, the Allsup’s at the corner of New Mexico 14 and Avenida del Sur is the first stop. A clerk who has worked there for nearly a decade says the flow of walkers has slowed over the years. But manager Elvis Paz says he still sees about five released inmates walk to the store every day. ‘There’s a bus?’Warden Derek Williams said the jail offers transportation for people who don’t have a ride: There’s a Blue Bus from the North Central Regional Transit District that comes by the jail multiple times a day. Inmates can also get a ride to the bus stop in front of the county’s youth facility on Airport Road. The RTD Blue Bus is a free option for inmates released between 6:45 a.m. and 5:45 p.m. But because many inmates are released later in the evening or in the early morning, they often walk. One former inmate said he had no idea transportation was a possibility. “There’s a bus?” a just-released inmate asked as he walked along the shoulder of New Mexico 14 toward Santa Fe at about 4 p.m. on a recent weekday. He’d been in the jail for six weeks on a probation violation and said he hadn’t heard about the option. Williams said the Airport Road drop-off option, which takes former inmates much closer to the homeless shelter and inside the better-lighted city limits, is offered on a form inmates must sign before they leave. But, he acknowledged, few people take it. Several inmates released recently, and lawyers who work with the jail population, said they had no knowledge of the document – or the ride to Airport Road. Vulnerable at nightHumphreys said he’s consistently heard about inmates having to walk from the jail into city limits. In the fall, he said, he had a female client who was so afraid to make the miles-long walk that she pleaded with a judge to let her stay in jail longer so she wouldn’t be released at night, alone, with no ride. 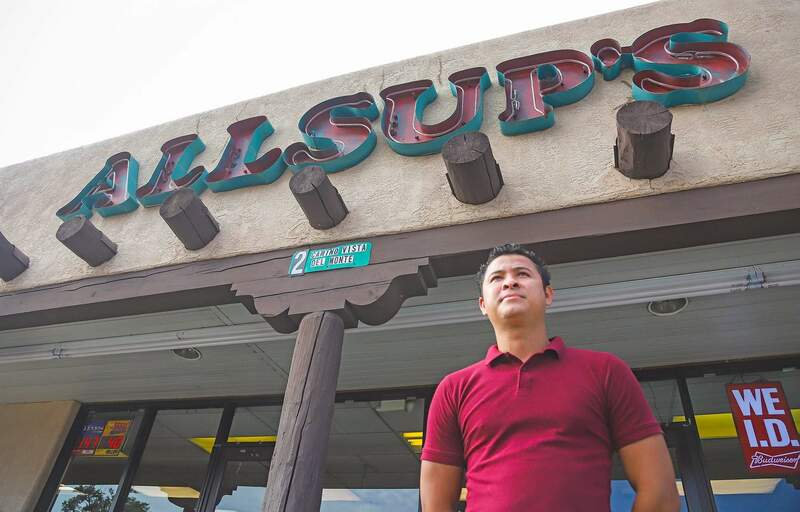 Elvis Paz, manager of the Allsup’s on Highway 14, stands outside the convenience store. People released from the Santa Fe County Detention Center often make their way to this Allsup’s to try to get rides or to make phones calls. When told some inmates claim they don’t see the form asking if they need a ride, Williams said he’d heard that complaint before. But when he checked the file, he said, there was a signed waiver. “That’s why I make them sign, so if somebody says, ‘Hey, you didn’t give them a chance,’ I can say, ‘Yes, I did,’” Williams said. Public defenders complain that some of their clients are exposed to extreme elements while walking. In the winter, it’s the cold and snow. In the summer, it’s the heat or unrelenting sun. Williams said rides from the jail to the juvenile facility, which operate according to staff availability, don’t always leave immediately. He said he has told staff members that if it’s dark or cold outside, they should prioritize giving people rides. In the winter, he said, they do get more requests. Juliana R. Pina, who had no ride from the jail when she left in early July, said timing of the transportation was one of the reasons she walked from the jail all the way to the area near Santa Fe High School. George Donald makes his way toward the Allsup’s on Highway 14 after his release from the Santa Fe County jail. The problem is complex, he added, noting there are concerns about liability issues. Williams also said the jail has asked the regional transit district if buses could come more often. But the plea was unsuccessful, he said. Jordan-Berenis said he, too, recognizes the issue is thorny. Part of the issue, public defender Jennifer Burrill said, is the trend of relocating jails from downtown areas to the outlying locales, exacerbating distance issues for family and friends who want to visit inmates – or take them home. “They’ve chosen to relocate these (jails) to very sparse areas with no resources. That’s a huge problem,” she said. Some advocates point to a potential solution in Albuquerque. A possible modelBernalillo County’s jail, the Metropolitan Detention Center, is located more than 15 miles from downtown Albuquerque. Inmates are not allowed to walk from that jail, said detention center spokeswoman Candace Hopkins. If they don’t have someone with a car to pick them up, they’re obligated to take jail transportation to downtown Albuquerque. Tom Starke, chairman of the Behavioral Health Alliance, said he thinks this is the kind of solution Santa Fe should explore. Santa Fe County received funds for jail employees last year through a gross receipts tax increase. That money – those new staff members – could help, he argued. County Commissioner Ed Moreno, whose district encompasses the jail, wrote in an email that he would support a program that would transport people from the jail to inside city limits if the county could find a funding source. Krickhuhn, the woman who lost her brother, thinks it’s high time.